The Ball State University Libraries’ GIS Research and Map Collection (GRMC) has created new custom maps in celebration of Black History Month. 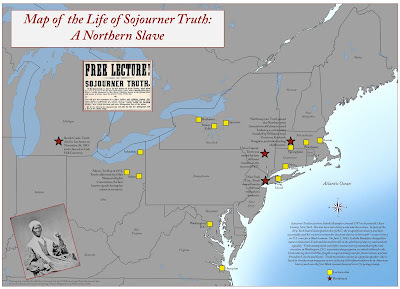 Map of the Life of Sojourner Truth: A Northern Slave commemorates an influential person in American history, while Hurley’s Muncie: 1950’s celebrates an influential person in Muncie and Indiana history. The Sojourner Truth map identifies the locations of important events in this advocate/orator’s life, like her attempt to desegregate the city streetcars and meeting Presidents Lincoln and Grant in Washington, D.C. The map also shows the locations of some of Truth’s famous speeches. Hurley’s Muncie is being exhibited as the “Map of the Month” in the front windows of the GRMC through February and is available from Cardinal Scholar. 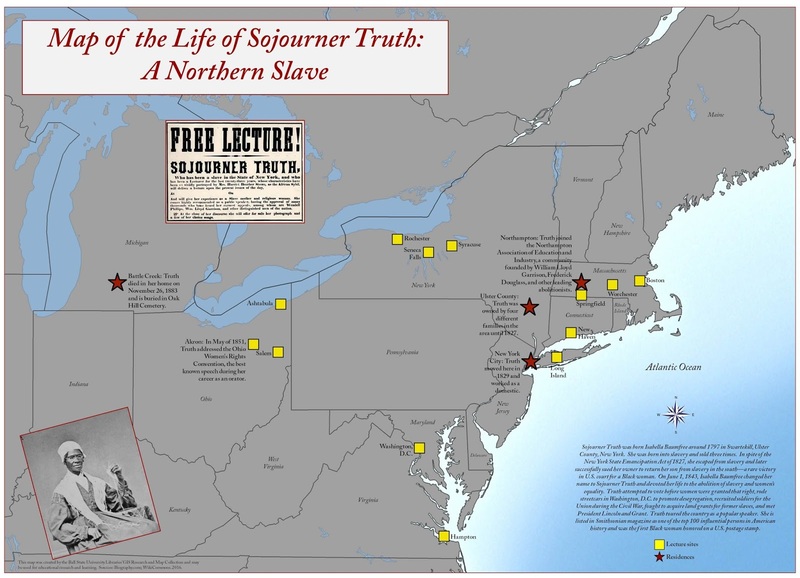 The Sojourner Truth map is also available for download from Cardinal Scholar. Both maps may be used for educational research and learning and for special exhibits. (Members of the Ball State University community may print large copies of the maps using the plotters in the GRMC). A subject guide identifying African-American cartographic resources is also available from the GRMC. For more information about using cartographic resources in the study of Black History, please contact the GRMC at 765-285-1097.